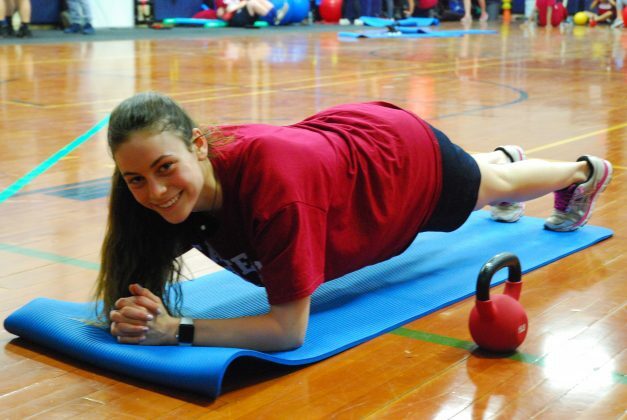 Junior Amanda Middleman does planks to follow her fitness portfolio in Eastern Regional’s Lifestyle Fitness course. 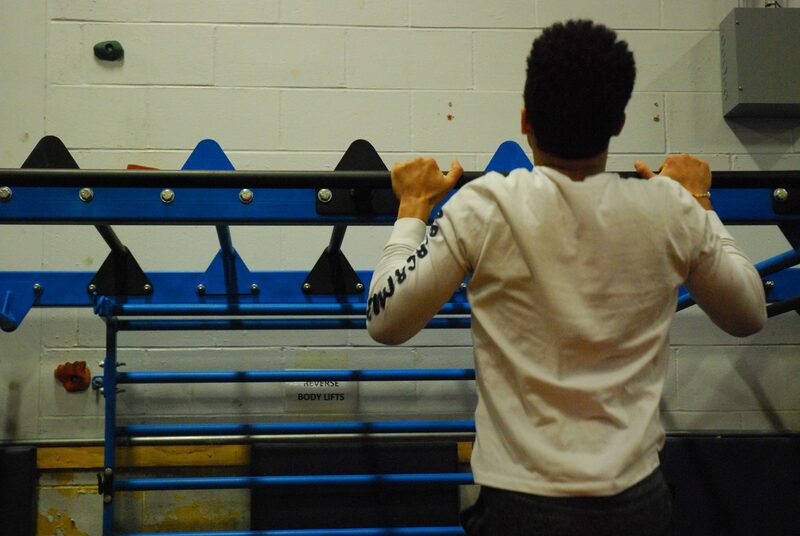 Junior Larry Davis does pull-ups on the bar during Eastern Regional’s Lifestyle Fitness course. 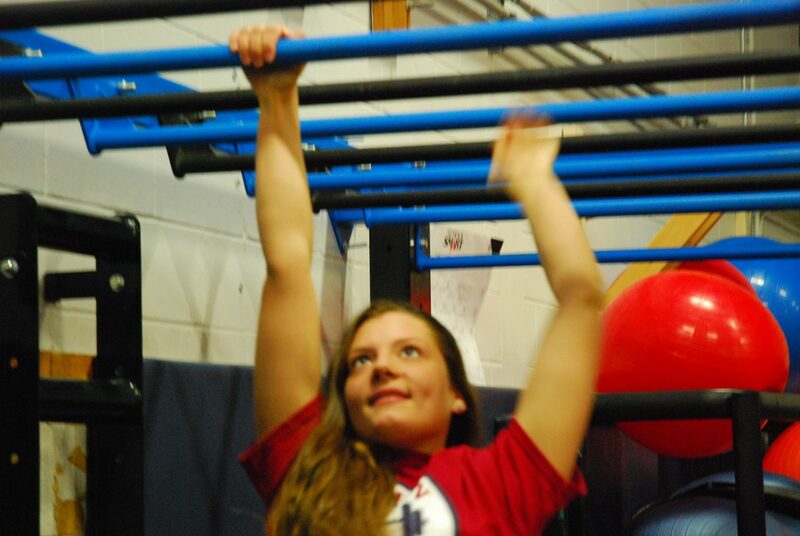 Senior Grace McGlinchey traverses the bars during Eastern Regional’s Lifestyle Fitness course. At the March Eastern Regional Board of Education meeting, four students offered their appreciation for an elective class called ‘Lifestyle Fitness,” an alternative physical education class that is in its first year. According to Dan Jones, teacher of the course is in his sixth year at Eastern, he pitched the idea to Athletic Director Jason Hill after Hill stated that elective models for P.E. courses would be considered for the then-upcoming school year. Jones put together a proposal that would allow students to work toward a specific goal with regard to their fitness or strength. “I like the idea of electives in general because the students are more motivated to participate simply because they chose to a part of something,” Jones said. Jones says the school’s traditional physical education curriculum already has “fitness days” built in for students, however it mixes fitness days with sport-based activity days; therefore, Jones wanted to create a solution for students who might not be interested in sports. “This class gives them a chance to stay physically active without feeling out of place in team sports and activities,” Jones said. At last month’s board meeting, the students told board members and those in attendance about their experience and accomplishments through the elective’s first year. The four students represent the approximately 100 students who signed up for the class in its first year. Sharia Na’eem-Musiddiq, one of the four students who spoke to the board, said that over the course of the year the class has done yoga, high-intensity training, weight lifting and parkour. “This is to give a student that wants to join the program a well-rounded experience with the class and also allow them to expand what they do outside of a general P.E. class,” Na’eem-Musiddiq said. She said when joining the class, her goal at the beginning of the year was to grow her arms. She felt the traditional P.E. class wasn’t helping her reach that goal. After the guidance department recommended the class to her, she saw a way to strengthen herself and learn more about fitness. Through the creation of a fitness portfolio, it allows students to set a specific goal and have workouts made to target that specific area, while also tracking their progress along the way. To work on her arm strength, Na’eem-Musiddiq set her goal at being able to do 40 curls with a 12-pound bar; of which she could initially only do 31. By the end of a six-week program, she reached 100 curls by following the fitness portfolio. Julia Dodd, also a student in the class, says the nutrition aspect of the course has also had a positive impact on her life, both in and out of school. Dodd went on a diet after learning more about nutrition through the course, cutting out sugar for 10 days. Thanks to the effort, she lost 18 pounds. According to the Centers for Disease Control and Prevention, approximately 100 million adults in the United States are obese, due to a mixture of poor nutrition and a lack of exercise. The class, which meets three or four times a week for 40 minutes each day, meets the U.S. Department of Health standard for adults of getting at least 150 minutes per week of moderate-intensity aerobic activity or 75 minutes per week of vigorous aerobic activity, according to Jones. All together, the class seems to have found a niche for students who want to work out or learn about working out, but don’t know where to start. “When I asked the students in a survey, ‘why did you join this class?’ most of the responses were that they weren’t very good at sports and feel out of place,” Jones said. Jones says there seems to be a “buzz” about the class around the school, and believes the number of students in the class will grow to start its second year.